In an election year, where politicians in Washington eat and breath partisan politics, the House voted Thursday to hold Atty. 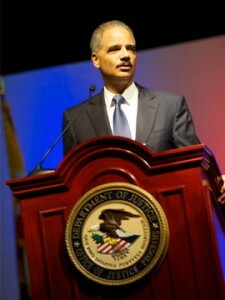 General Eric H. Holder Jr. in contempt. He becomes the first Attorney General to be held in contempt of Congress. The Republican led contempt action was in response to allegations that Holder had failed to produce documents relating to the botched ATF Fast and Furious operation that encouraged Arizona gun dealer to sell to middlemen, all with the hopes of tracing the weapons to the Mexican cartels. The Washington Post reported that the vote was 255 to 67. The House will send the matter to the D.C. U.S. Attorney Ronald Machen, who will have to decide whether to file criminal charges against Holder, who is his boss. Posted: 6/28/12 at 5:50 PM under News Story.